New York, NY - The award-winning documentary feature film "A Billion Lives" is kicking off its worldwide theatrical release on Friday, October 28, 2016, with a one-week limited engagement playing in New York City at the Cinepolis Chelsea until November 4th. To kick off this special engagement, members of the media and concerned thought leaders are invited to join award-winning Director Aaron Biebert for an exclusive screening and panel discussion. The National Center for Public Policy Research is pleased to announce that the NYC Host Committee is being chaired by Manhattan resident Jeff Stier, a senior fellow at the National Center for Public Policy Research. Stier, who appears in the film, is a leading proponent of market-based approaches to public health and a thought leader on tobacco harm reduction. Stier recently authored a chapter in the Adam Smith Institute report, "Sinnovation, how markets can solve public health problems - but government gets in the way." In the report, Stier wrote that "E-cigarettes have split the public health lobby in two. On one side are those focused on harm reduction, who see e-cigs as a substantially safer alternative to cigarettes for people who are already smokers. On the other are those who see fundamental lifestyle change as the goal for smokers, and e-cigs as an obstacle to that." "In 'A Billion Lives,' producer Aaron Biebert beautifully depicts the magnitude of the divide," says Stier. The World Health Organization (WHO) estimates that a billion lives will be lost this century due to smoking-related illnesses. Meanwhile, smoke-free alternatives, like e-cigarettes and vapor technology that are helping people quit smoking, are estimated to be 95% safer than smoking cigarettes, yet are being banned, restricted, and unfairly maligned as "a gateway to smoking" and "dangerous." Dr. Sally Satel, MD, an authority on mental health and domestic drug policies in the U.S. A practicing psychiatrist and lecturer at the Yale University School of Medicine, she examines political trends in medicine and has a lot to say about what is exposed in "A Billion Lives." David Goerlitz, a retired professional model known around the world as the "Winston Man" throughout the 80's, was the first representative of the tobacco industry to not only quit smoking, but to advocate against smoking while employed by a cigarette company. 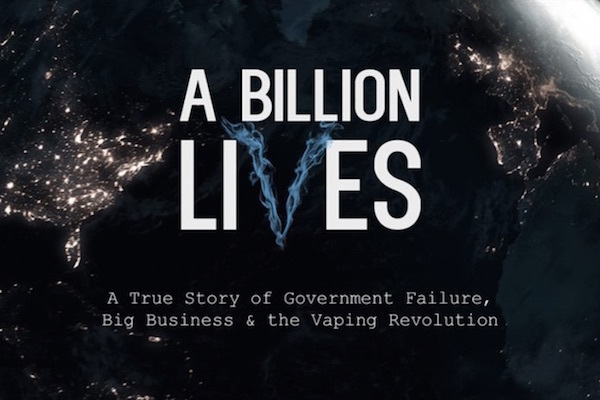 The panel, which will begin immediately after the 8pm screening, will be moderated by Jared Meyer, a public policy expert with the Manhattan Institute and author of the recent Forbes Magazine article titled, "Government Puts Tobacco Interests Above A Billion Lives." Interview opportunities with Aaron Biebert, Dr. Sally Satel, David Goerlitz and Jeff Stier are available upon request. The media is invited to attend the "A Billion Lives" premiere/panel discussion on Friday, October 28th at the Cinepolis Chelsea Theatre. Seating is limited so please RSVP by October 24th. For additional information, visit ABillionLives.com/New-York-City. View the trailer at ABillionLives.com. Film screeners are available upon request. Jeff Stier is a Senior Fellow at the National Center for Public Policy Research in Washington, D.C., and heads its Risk Analysis Division. His National Center op-eds have been published in top outlets including The Wall Street Journal, USA Today, The Los Angeles Times, the New York Post, Forbes, theWashington Examiner and National Review Online. His more scholarly writing has been published in the Hoover Institution's journal, Defining Ideas, The Cato Institute's Regulation, and Springer's Cancer Causes and Control. He has testified before many bodies at the city, state and international level and has appeared on the Fox News Channel, CNN, CNBC and other television networks and is a guest on talk radio programs approximately 100 times a year. The National Center for Public Policy Research, founded in 1982, is a non-partisan, free-market, independent conservative think-tank. Ninety-four percent of its support comes from individuals, less than four percent from foundations, and less than two percent from corporations. It receives over 350,000 individual contributions a year from over 96,000 active recent contributors. Sign up for free issue alerts here or follow us on Twitter at@NationalCenter.